Thought I would finally get around to starting a new poll for the portal. So here it is! 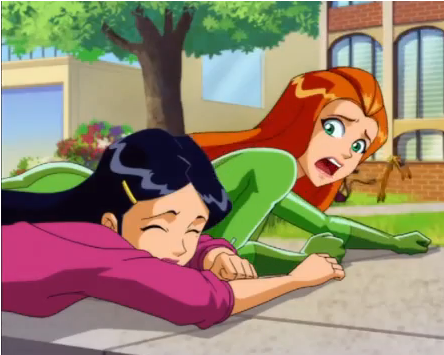 Who is your Totally Spies waifu and why? waifu. Noun. (fandom slang) A fictional character from non-live-action visual media (typically an anime, manga, or video game) that one is attracted to and considers a significant other. Note, you can only choose one! For me of course it is and always has been Mandy. Why? Because Mandy Is Great. She's far more gorgeous, cuter, sexier, lovelier, smarter, trendier, richer, wittier and more wonderful than all the other characters. Take that spy losers! Muffy is my avatar and I totally ship Stacy x Muffy, so I guess Stacy is my only answer! Good choice, but you forgot to vote for her in the poll. Nice- a classic sort of topic. So many options! But if I must, and it's extremely close because the heroic, beautiful main trio & Britney are nearly equal for me. Sam takes first for her appealing personality & mind to go w/all the rest... but just barely over Alex, then Brit, then Clover. Seriously, 9.9, 9.8, 9.7, 9.6 would be my scores. Husbando... XD I laughed to much at that. I voted for Alex of course, but it doesn't show! Come on I would so, /looks in mirror/ eh, eh, I better retire myself. You forgot to click to vote. By all rights it "should" be Sam since I love both redheads and Jen Hale (I'm also a longtime Femshep fan). However I've always found Clover to be just adorable. It's hard to say exactly why, and in real life we wouldn't be each other's types at all. I love her voice, Valley Girl accent and occasional squeakiness and all. I even think it's cute when she screams (which she seems to do at least once per episode). I like how she's always the most reluctant to go on missions unless they involve (a) shopping, ( modeling, � acting, or (d) impressing some guy she's hot for. I also like it when she has to step up and run things (Eraser, Child's Play) or even go solo (Matchmaker) as it shows she has a more mature side after all. Despite her almost brazen self-confidence, there's also a kind of vulnerability about her, as she is always trying to be a model (Model Citizens) or actress (Abductions, Starstruck) and usually having no luck, or wanting to be taken more seriously (Child's Play). Oh come on, Kira-chan, I'm sure she likes you back. She may even let you give her a full body massage. Alex. I'm into sweetness, now. Why ? Because she seems like a genius, a real geek infact. Look at what she invented : mind control ! She gave super powers to Arnold and to Clover ! She even created an entire island ! And since she's a genius, we won't have to do domestic chores. I'm sure she will get us one or several domestic robots to do it (or, if some stupid person really annoyed me/us, she will use mind control to make it our personal domestic ). Nice choice, Darksmelo. Geraldine is the sexiest woman in TS, I believe. Well, the Spies and their friends are not "women" (as in "adult") but "girls" for most of the series, but even if I included them, Geraldine would still make the top three. Make that the top two.